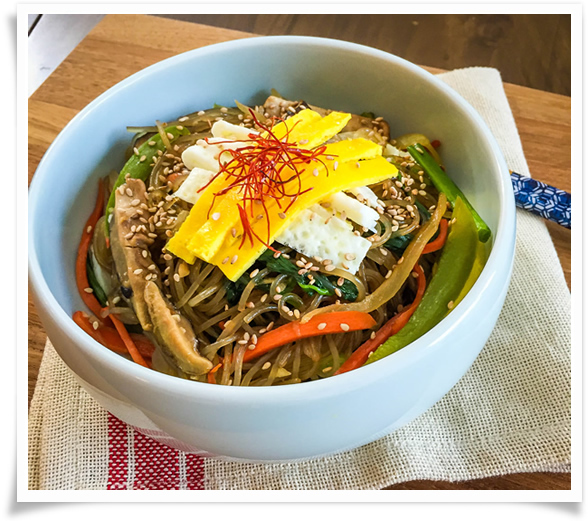 The biggest difference between the two japchae recipes is that the simplified version doesn't require boiling the noodles, and most of the ingredients are cooked together rather than separately. Start by soaking the noodles in warm water. There are many different brands available at Korean supermarkets, but I always use this brand. It is also already cut so it is easier to handle. It's important to soak for about an hour, so before you do anything, place warm water in a shallow pan and place the noodles. Set aside. In a pot of boiling water, blanch the spinach for 30 seconds to a minute. Rinse under cold water and squeeze excess water. Season with 1 teaspoon soy sauce, 1 teaspoon sesame oil and 1/2 teaspoon minced garlic. Set aside. If using eggs, separate the yolk from the whites. Mix the yolks together and the whites together. Heat a pan with a light coating of oil. Cook the egg whites in a thin layer for a few minutes until it sets. Remove. Repeat with the yolks. Remove. Let it cool, and then cut into little strips. Set aside. 1/2 of the egg strips will be added into japchae while the other 1/2 will be used to garnish the dish. You can easily omit eggs if you prefer (sorry no pictures!). When the noodles have been soaking for at least an hour, drain the water and have the noodles ready. The noodles will be malleable, but not completely soft. Heat 2-3 tablespoons of vegetable oil in a big pan. Add 2 cloves of minced garlic (about 1 teaspoon) and start sautéeing onion. After a few minutes, add carrots, mushrooms, and bell peppers. Sautée for a few minutes until the vegetables are a little soft. Add the noodles into the pan, and pour 3-4 tablespoons of water into the pan. Cook for a couple of minutes. Add the marinade and cook for another 3 minutes or so. It is important you don't over cook the noodles because it will get gummy and mushy. When the noodles are almost done, add green onion, spinach, and sesame oil. Remove from heat and add 1/2 of egg strips, mix well. Taste and adjust seasoning accordingly. Place in a pretty bowl, sprinkle some sesame seeds, and add the remaining egg strips and red pepper threads for garnish. You are ready to eat! This recipe is a little easier to make, but you can still taste the salty, sweet flavor of japchae that makes the dish so delicious. Like I mentioned on the other post, you can make your own modifications by adding meat, omitting the egg, adding more vegetables, or adding different ingredients altogether. Japchae is versatile and can easily accommodate different dietary needs. Since we are all so busy, it's not always easy to make time consuming dishes. With a few modifications, you can still enjoy the homemade flavors without having to slave in the kitchen all day long. Enjoy!